Archive of 2004 PNC Info. 12/31/04 - The January 2002 issue of Coil Line is now online in the 'Reference' section. 12/27/04 - Frank Covey forwarded a color copy of his Coil Line article in Word Format of a newly discovered variety of the (5�) Nonprofit SA Seacoast from Ashton-Potter with Serpentine die cuts on two sides (vertical sides). The variety is called the Black Ghost. 12/18/04 - Renate Fearonce in Tucson writes to say that she has a 10k coil of the Sea Coast  B111 (21) 2002 date, top black #s every 10 in position 2L, stamp is tagged ( prephosphored). 12/9/04 - Scott Publishing Company has assigned catalog number 3447a to the (10�) Lion with plate S55555 and 2003 date. All affected data pages have been updated. 12/6/04 - Dr. Kelly Hejtmancik advises that he obtained a strip of 25 of the Scott #3874 (Reprint of the Sea Coast, black 2003 date, serpentine die cuts vertically only, plate number P2222) from the USPS in Kansas City. The item number is 781434 for the strip. A call to Stamp Fulfillment Services revealed that the order number for the full coil of 10,000 is 781432. Michael Grusby notes that the data page for the Stamp Venturers 5� Canoe listed it with Overall Tagging, which is not correct. That has been changed to Untagged. Dennis Ladd offered a suggestion that we publish information on where to send postage donations to be used for the good of the club, so here it is. Donations can be sent to PNC3 President, Frank Covey, 16 Grandview Drive, Macomb, IL 61455. Frank has a precancel permit, so he can use either first class postage or precancel scrap. 11/30/04 - The December 2001 issue of Coil Line is now online in the 'Reference' section. 11/23/04 - Michael Grusby mentioned that the 'Small-Large Date Chart' in the 'Reference' section was outdated with the new information contained in the chart below. It has been updated and is now a handy reference for all PNC coil stamps with Small-Large date listings. J. Chandler Jr. made a 'cut and paste' correction. PNC3 President Frank Covey sent a brochure containing pictures of '25 Years of PNCs' shirts. Click here to see the shirts in Microsoft Word (.doc) format. The shirts are for sale to members only and Frank will have more information in his column in Coil Line. 11/22/04 - This is an update with new or changed numbers appearing in the 2005 Scott Specialized Catalogue. All affected data pages have been updated. Robert Rabinowitz is reporting plate S4444 on the Sennett Security 37� U.S. Flag coil of 100. No word yet if the new number has Smooth or Uneven Tagging, or if it is in the stick format. 11/21/04 - Ronald Blanks in an article in the issue of Linn's Stamp News dated November 29, 2004 writes about a recent discovery of his. Ron found, on cover, several tagged (prephosphored) 2003 Ashton Potter Sea Coast stamps with the serpentine die cuts on all four sides. Steve Esrati notes that a subscriber to his newsletter also found a tagged Ashton Potter stamp with serpentine die cuts on all four sides and Steve has added an 11th line to his chart showing the variations among the (5�) Sea Coast stamps. Jim Kloetzel, editor of the Scott Catalogue, stated that the new variety will be assigned #3785a. The new number has been added to the affected pages. Jim Nelson writes to say that his December 2004 price list is ready. Click here and then scroll down for details. Steve Esrati called my attention to a missing link in the 'PNC Data' bar. Now there are links to both the 2 and 4 sided serpentine die cut Ashton Potter Sea Coast coils under the 'New Stamps - 2004' heading. Also new in the 'PNC Data' bar is a link to a page listing all the "Comparison Pages" on our web site. 11/15/04 - A revised Plate Number Coil Souvenir Page spreadsheet in Excel format has been posted. Added were three pages issued this year with plate number coils on them. If you collect these 'American Commemorative Cancellation Pages', as the USPS now calls them, there are still a few plate numbers and positions that we need to verify. 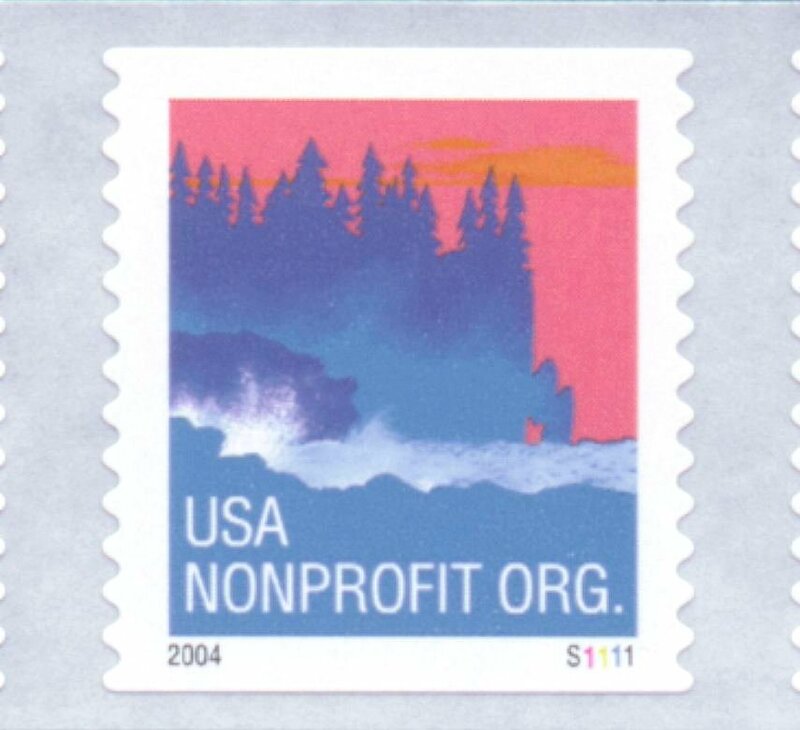 11/14/04 - Lorelei Doering wrote to report that the Sennett (5�) Sea Coast water activated stamp is available in two coil sizes, 3000 and 10,000. The USPS order numbers have been added to the data page and the Sea Coast comparison page has been updated. The 10,000 coil has 5 digit pink back numbers. Top positions have been reported. Are there others? Thanks to production details published in the 11/22 issue of Linn's Stamp News, we have updated the data page for the 37� Snowy Egret, Ashton Potter coil of 100 issued in March 2004. 11/11/04 - The results of our PNC3 auction #31 which ended October 20, 2004 are now posted online. All the auction information can be accessed by using the 'Membership' button, or by clicking here. Thanks to Auctioneer Joe Sedivy for another successful auction. 11/10/04 - Renate Fearonce in Tucson writes to say that she has a couple of recent coils in stock and includes her inventory list. Michael Mules is the first to report a new plate color sequence on the BEP U.S. Flag coil of 100. Plate numbers starting with 1111A have the colors Cyan, Magenta, Yellow and Black in that order. Previous numbers 1111 thru 9999 have the colors Yellow, Magenta, Cyan and Black. 10/31/04 - The November 2001 issue of Coil Line is now online in the 'Reference' section. 10/30/04 - Several dealers have reported that they now have in stock the elusive 37� Egret Coil with plate V3212, which was first reported here on 2 Aug 2004. A scan is shown near the bottom of this page. Carl Wicklund reports that he purchased a PSA 37� U. S. Flag 2002 date coil today with plate 3333A. 10/23/04 - Michael Grusby notes that back numbers on the (5�) Sea Coast with Serpentine Die Cuts on two sides (Scott 3874) are either 2, 3 or 4 digits. The additional information has been added to the data page. 10/21/04 - 'Plate numbers on Souvenir Pages' data has been updated with the arrival of USPS shipment 0403 which contains a page with the 10� American Eagle. If you collect Souvenir Pages, I urge you to check the list as we need your help to fill in missing information on a number of pages. The link is in the 'PNC Data' bar. 10/20/04 - The Ashton Potter Sea Coast pages have been reworked a tad. The major change is the listing for the stamp image measurements, which now more accurately reflect the actual size. 10/19/04 - The (10�) Lion data page has been updated with additional information and scans of the S55555 stamp, which includes a scan with both the S11111 and the S55555 together. 10/13/04 - Rob Washburn announces that his next pnc commercial covers pricelist will be available on 10/22. Anyone wanting one should send a 60� SASE to: Rob Washburn, P.O. Box 840, Skowhegan, ME 04976. I've added a note to the (10�) Lion data page about the 2003 date on the S55555 stamps. I'll add a scan when they are available to me. I suspect that Scott will assign a minor letter to this variety. 10/12/04 - Donna Rajotte wrote to advise that the 10� Lion with plate S55555 has a 2003 date, compared to 2000 on the first four plate combinations. 10/11/04 - Scott Publishing Company has assigned catalog numbers to the Sea Coast coils. 3874 to the serpentine die cut 10 vert., Ashton-Potter printing and 3875 to the serpentine die cut 11� vert., Sennett printing. All the affected pages have been updated. 10/8/04 - Donna Rajotte in Providence reports that she has a new number, plate S55555 on the (10�) Lion. The data pages have been updated. 10/1/04 - A (5�) Sea Coast comparison page has been posted. It is a work in progress and comments are welcome. The October 2001 issue of Coil Line is now online in the 'Reference' section. 9/27/04 - Auction Director Joe Sedivy has the lots for PNC3 Auction #31 posted. The auction ends October 20 and you must be a member to bid. Click for a 'Word' or 'Works' file and here for the bid form, or go to the 'Membership' tab for this or past auctions and/or to join the club. Joe asks that you please include your email on your bids. 9/24/04 - Renate Fearonce in Tucson reports that she has 2 more coils of the 10K Sea Coast, die cut all 4 sides, P1111 every 22 stamps, 2003 date, bottom aqua back #s ( upside-down ) every 20, positions 2R, 2L and #on#. The positions occur every 220 stamps. If you need a certain position, you need to order at least 100 stamps and she will get it for you. If you want all the positions or #on#, then it is 220 stamps. 9/21/04 - Donna Rajotte in Providence reports that she has the (no longer a) 'Mystery' Sea Coast coil with die cuts on the sides pictured below. Donna says that "It is a Sea Coast PSA coil of 10k, Ashton Potter printing with die cuts on two sides only, plate number P2222 every 27 stamps, top and bottom back numbers every 10 stamps, 270 stamps for all positions." 9/20/04 - The Mystery Unravels - Pictured to the right is a scan cropped from a plate strip of 7 stamps submitted by Scott Walker. The stamp is from one of the 'Mystery Coils' referred to below on September 15. 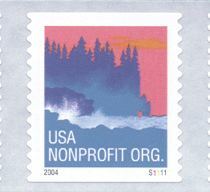 Gary Wulfsberg supplied a scan of the cover with the Sea Coast stamp with Plate P2222. Other supporting data within the last two days was furnished by Gary and Robert Rabinowitz. The stamps were printed by Ashton Potter in coils of 10,000 with plate P2222 and a 2003 date. The back number is a blue dot-matrix number with 8450 on the bottom. 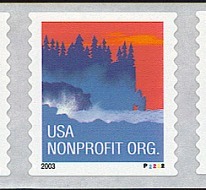 Ashton Potter also used plate P2222 on a Sea Coast with die cuts on all four sides and a 2003 date. It appears that Ashton Potter used two different die cut mats to process the 2003 dated stamps. Click on the above scan for more detailed photos. Robert Rabinowitz and Steve Esrati are both reporting plate P33333 on the 37� Snowy Egret from Ashton Potter. Because of unforseen circumstances, the Cuy_Lorpex 2004 Regional Meeting has been cancelled. 9/18/04 - Renate Fearonce in Tucson reports that she has a 10k PSA Sea Coast Plate P1111 with upside down back numbers. 9/15/04 - Are there mystery coils lurking out there? Herb Holmes in a report printed below, Ron Blanks in a discussion on the Virtual Stamp Club and Linn's in a story in the September 20th edition, all call attention to Self-Adhesive (5�) Sea Coast coils with a 2003 date, similar to that shown below, that have been found on cover. So far, none of these have been reported mint or with a plate number which would pinpoint the printer. Speculation has it that Sennett Security may have printed the Sea Coast with both 2003 and 2004 dates. Any additional information or finds would be appreciated. Thanks to Mike Murray for spotting a typo on the 20� Official data page. Tom McFarland wrote to let me know that the links to USPS Form 3615, Authorization to use Precancel Stamps, had changed and were no longer working. The links have been corrected. 9/14/04 - Attached is a scan of the 'Previously Issued Reprint' of a new printing of the (5�) Sea Coast announced in the September 2nd issue of the Postal Bulletin. The new format is from Sennett Security Products (SSP) in a coil of 10,000 Pressure Sensitive Adhesive (PSA) stamps with a 2004 date. My copies from Stamp Fulfillment Services in Kansas City, have 5 digit pink, bottom, back numbers. Click on the scan for a larger, more detail image. In the same Postal Bulletin mentioned above are technical details for another Sea Coast reprint. This is a 10,000 stamp coil from Ashton Potter with Plate P2222. I have incorporated the information into the current data page. Previous printings by Ashton Potter were a 10k coil with plate P1111 and a 3k coil with plate P2222. Herb Holmes sent an email with information that he has found several Sea Coast stamps with a 2003 date, straight edges top and bottom and a scalloped die cut. I'll try to sort everything out and do a comparison page. It looks like it might be a good idea for a comparison page on the Atlas stamps also. I'm waiting for copies of the newest Atlas from Donna Rajotte and will have scans when they arrive. Renate Fearonce in Tucson writes to say that she just received the new 3K Atlas. It is plate # V12222, 2003 date, middle aqua back numbers (5 digit), back number in position 2L every time. 9/11/04 - Donna Rajotte in Providence reports that she has the Atlas PSA coil of 3k (sale date 9/13/04), plate number V12222 every 10 stamps, blue five digit middle back numbers every 10 stamps. Position 1 only every 10 stamps. Donna says these coils seem to be the same as the 2003 Avery Dennison coils of 10k, including the date. 9/5/04 - Maurice Bessette at the Philatelic Center in Oneco, CT 06373 has plate 2222A on the BEP 37� US Flag coil of 100. I've received a couple of reports that Oneco is out of the 2222A. 9/4/04 - According to information from Anthony Willson, there will be a Regional PNC3 Meeting at SESCAL on October 2nd at the LAX Radisson. Tentative information has been posted for the 2005 National Meeting in Grand Rapids, Michigan. Click on the 'PNC3 Membership' bar for details. Renate Fearonce in Tucson sent an email listing some new items she has in stock. 9/1/04 - The September 2001 issue of Coil Line is now online in the 'Reference' section. 8/10/04 - I'm leaving today for a vacation in California and will not be back until September 1. Please contact John.Cropper@pnc3.org if anything urgent needs to be posted during that time. See you at the show in Sacramento. 8/07/04 - Just a reminder that next Saturday, August 14 is the date of the Annual Meeting which will be held at the APS StampShow in Sacramento, California. 8/06/04 - We now have a picture and contact information for our Membership Chairperson, Janet M. Gillis, on the Officers Page. Carl Wicklund reports that he received a cover in the mail a few days ago with plate #V12222 on the 10� Atlas. 8/02/04 - John Cropper has confirmed the existence of V3212 on the 37� Snowy Egret PSA coil of 100. He had originally reported this to me by e-mail on July 22, but asked that the story be held until he could confirm from the source. Peak/Valley of this number is proving elusive, however. Renate Fearonce in Tucson sent her latest inventory in Excel format. 7/30/04 - The August 2001 issue of Coil Line is now online in the 'Reference' section. PNC3 Treasurer Andy Jakes suggested some format changes which have been incorporated into the online Glossary. 7/20/04 - The 'List of PNC Detail Pages' in the 'PNC Data' bar on the left has been reworked, hopefully to make it easier to find the stamp you are looking for. Let me know if you have any comments or suggestions. 7/19/04 - Scott Publishing Company has assigned catalog number 3864 to the Sennett (5�) Seacoast water activated coil. Steve Crippe advises that he just purchased a Miscut and 1/2 Imperf, 1/2 Die Cut roll of 100, on #3632a, the BEP 37� US Flag coil of 100 with Plate #1111A. Peter Hoffman pointed out a transposed die cut listing on the Ashton Potter (5�) Sea Coast PSA coils. I have also changed the 'Series' designation to American Scenes. This data page shows the new format that will be used in the future for 'Series' listings that the USPS, in the Postal Bulletin, either ignores or lists inconsistently. Other series designations will be changed as time permits. 7/14/04 - Carl Wicklund has a cover with plate V12111 on the (10�) Atlas. I hope to have a scan soon. 7/12/04 - Bob Rabinowitz reports plate 2222A on the BEP 37� US Flag coil of 100. Yesterday, I added several new items to the online Glossary. I also updated some information and added internal cross-reference links to the glossary. 7/7/04 - The Providence, RI Philatelic Office has announced that they will now accept credit card payments. Click here to see the announcement and read Donna Rajotte's comments. 6/30/04 - The July 2001 issue of Coil Line is now online in the 'Reference' section. 6/29/04 - Alan Thomson came up with expanded definitions for 'Inverted Die Cuts' and 'Reverse Die Cuts' which have been incorporated into the online Glossary. The auction item mentioned below on 6/18/04 is an "...unused PNC with yellow plate number omitted". Information from a copy of the APEX certificate 143027. Renate Fearonce in Tucson reports that she finally has received the new Seacoast 3K coil. Plate # S1111, every 14 stamps, 2004 date, pink back #s top and bottom, bottom numbers slightly high, #/# every 70 stamps. 6/22/04 - Steve Esrati reports that Al Haake has the 37� Flag from Sennett in rolls of 100 and the plate number combination S3333 but with mottled tagging. Dan Kauffman found several instances of the 'cut and paste' gremlin at work on the "G" stamps. Scott #s 2888, 2890, 2891 and 2892 had the word Prephosphored butchered. Amos Press announced today that they have acquired Stamp Collector newspaper and the Krause-Minkus catalogues, and plan to shut down SC. The issue that goes to press this week (dated July 5) will be the bi-weekly's last. 6/18/04 - The data page for the Sennett (5�) Seacoast water activated coil has been updated with a scan of the stamps and other technical information. Richard Chiado of Lakeshore Stamps advises that Superior-Regency Auctions will have a possibly unique PNC item in their August APS Stampshow auction. They will be offering a Scott # 3281, 1999 33� Flag & City, Self Adhesive, MNH, OG, VF-XF, strip of 5 with a missing plate number with a 2002 APS Certificate. Richard says "It is truly a rare discovery and possibly unique." I have contacted Superior-Regency and the APS to try and get more information. See 6/29 item above. Richard Krakowsky supplied a strip containing what may be a Constant Plate Variety on the Ashton Potter Snowy Egret. Are there other examples? 6/14/04 - Scott Publishing Company has assigned catalog numbers to the (25�) American Eagle water activated coil. Click here for the list. The stamp with the plate number, the gold background & gray eagle, gets number 3849. Scott will list a plate strip of eleven stamps. Donna also has the 23� Washington PSA coil of 100 with plate V45 every 11 stamps. USPS item number 772000. The coils all appear to be V/P. 6/8/04 - Renate Fearonce in Tucson has the (10�) Atlas, 2003 Version, plate V21111, mid aqua back numbers in position 1, or 3 to the left when looking at the face. Plate number is every 10 stamps. 6/3/04 - Immediate Past President Gene Trinks and I have been working on an expanded Glossary for the PNC3 Catalog and as a result the online Glossary has been updated with new terms and a few corrections, one of which was from Kevin O'Connor. 5/31/04 - The June 2001 issue of Coil Line is now online in the 'Reference' section. 5/29/04 - Donna Rajotte in Providence reports that she has the 37� Snowy Egret PSA coil of 100, plate number V3222 every 11 stamps. USPS item number 782200. Lorelei Doering provided a scan of the different die cuts on the 33� City Flag 3K and 10K Self Adhesive coils. Click here for the scan. The data page has been updated with a link. 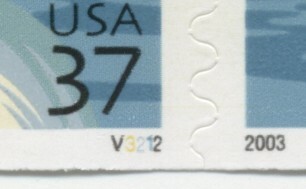 In an article in the June, 2004 issue of Coil Line, Doug Iams notes that according to John Greenwood, a couple of new imperf (die cutting omitted) examples have been found on the BEP 37� US Flag (3333 and 6666) and one on the Sennett 37� US Flag (S2222). An updated listing of scheduled Regional Meetings has been posted. 5/27/04 - Steve Esrati reports that Al Haake has plate P22222 on the Ashton Potter 37� Snowy Egret coil. Renate Fearonce in Tucson advises that she has V45 on the 23� George Washington and S44444 on the (10�) Lion coil. Carl Wicklund reports that he received two different envelopes with the unreleased (5�) Water Activated Sea Coast coil of 3000 with a 2004 date and plate S1111. The coil is scheduled for release June 11. Click on the scan for a larger image. 5/21/04 - Julian Jakubson of Philatelic Arts announces the 2004-05 edition of his Guide To Collecting Plate Number Coil Stamps. The price guide is available in two different formats. More information is available at his web site or the PNC3 dealer listings in the 'Collecting PNCs' tab. 5/19/04 - Word from Jim Kloetzel, Editor of the Scott Catalogue, via Steve Esrati and Bob Rabinowitz is that the (25�) American Eagle water activated coil will be included in the new Scott album supplements as a strip of 11 stamps. Jim also noted that the catalogue will list strips of 10 and 11. No word yet on which stamp will get the first number, but the strip probably will be numbered as pictured below, with the leftmost gold on gray stamp added to the right side to round out a strip of 11. 5/17/04 - The (25�) American Eagle water activated coil is in and scanned. I've tried to show the colors as close to the printed colors as possible. I'll be working on that. Note that the color order is different than on the self adhesives. Scott has not yet decided on which size strip to list. Click on the scan below for a larger version. 5/13/04 - Technical details were published today in the Postal Bulletin for the Sennett Security (5�) Sea Coast coil of 3000 with water activated gum to be issued June 11. A data page with tentative information has been posted. 5/12/04 - A phone conversation today with an official at Avery Dennison Security Printing Division confirmed the correct spelling of the Dia Nippon Kiko webfed gravure press that they use for printing U.S. stamps. A search of the site turned up three instances where the name was mis-spelled. They were Scott numbers 2495Ab, 2886b and 2915, all of which have been corrected. A couple of new comparison scans have been added to the data page for the 2004 Ashton Potter (5�) Sea Coast PSA coil of 3000. There is also a link to a story with illustrations written by Frank Covey. 5/11/04 - According to Donna Rajotte, the colors on the (25�) American Eagle WAG coil of 3k will appear in the following order: (l to r) The gray eagle on gold, gold eagle on green, blue eagle on gold, gold eagle on blue, red eagle on gold, gold eagle on gray, green eagle on gold, gold eagle on red, blue eagle on gold, and the gold eagle on blue. The back numbers on Donna's coils are one stamp to the left of the plate number. Martin Frankevicz of Scott Publishing Company confirmed today that the (5�) Ashton Potter 3k PSA Sea Coast coil issued April 6, 2004 will not receive a catalogue number. The two data pages have been combined and the affected lists have been updated. 5/10/04 - Robert Starkey, our old friend from Providence Philatelic, caught a typo on the Miscellaneous Self Adhesive checklist concerning plate number V3222 on the 37� Egret. The correction has been made. Renate Fearonce in Tucson advises that she has received three different 37� Flags. 5/6/04 - The data page for the 2004 SSP printing of the 37� U.S. Flag has been updated to show the existence of stamps with Uneven Tagging and Smooth Tagging. Donna Rajotte in Providence reports that she has the (25�) American Eagle WAG coil of 3k, plate number S1111111 every 10 stamps, pink top/bottom/middle four digit back numbers every 10 stamps, position 2 only. The plate number is on every gold stamp with the slate gray eagle. The back number is on every blue stamp with the gold eagle. (Sale Date May 13). USPS item number 782500. The data page has been updated with this new information. 4/30/04 - The May 2001 issue of Coil Line is now online in the 'Reference' section. 4/28/04 - Dennis Ladd, over the past several months, has compiled a new 'Coil Line Index' in Microsoft Word format (.doc), covering issues through 2000 (Vol. 13). We are looking for suggestions on how to best present it for your use and also need some sharp eyes to catch errors and typos. Links to Coil Line back issues and Indexes are in the 'Reference' tab on the left. 4/27/04 - Conrad Keydel reports that the Coil Roll Chart has been updated. Please check it out and send Conrad any addition/corrections. Click on the above link to access the Coil Label Study Group page and the Coil Roll Chart. 4/26/04 - Carl Wicklund sent in a photocopy of the (10�) Atlas Statue stamp with plate V21111 that he found on cover and which was reported here a week ago. The scan is pictured below. Carl also reports that today he found an Atlas with V22222 on an envelope from Ameriquest Mortgage Company. That scan is on the right. 4/25/04 - Jeff Fiszbein sent me a report in early February that I filed and did not post. At the Plymouth regional meeting yesterday, Jeff showed me a strip of 4 and a used single of the 3� Star stamp, which are tagged with 'very solid green tagging', and appears to be surface tagging. Jeff states that they came off charity reply envelopes (with a strip of 5 of the 5� Toleware coil), but doesn't know which charity since they are only the 'cut' corners. A link has been added to the 'Online Resourses' tab for the Virtual Stamp Club, hosted by Lloyd de Vries, which he describes as "The best philatelic and postal news, information and discussion on the Web." Basic membership is free and the discussion is very often quite lively. 4/23/04 - Donna Rajotte in Providence reports that she has the (10�) Atlas Statue PSA coil of 10k with plate number V21111 every 10 stamps, blue 5 digit middle back numbers every 10. Position -1 (back number three to left of the plate number) only every 10 stamps. USPS item number-791200. Donna also has a new back number position on the (25�) American Eagle PSA coil of 10k with plate number S2222222. 4/19/04 - Rob Washburn announces that his newest pnc commercial covers pricelist will be available only by mail on 4/23. Anyone wanting the pricelist (who isn't already a current customer) should send a SASE to Rob Washburn, P.O. Box 840, Skowhegan, ME 04976. Richard Nazar announces that his Microsoft Excel spreadsheet of basic PNC Catalog Numbers was updated on April 16, 2004. Click here for further information. Renate Fearonce in Tucson sends word that she just received the new (5�) Seacoast 3K coil. It's plate number P2222, every 27 stamps. She has both top and bottom aqua back numbers. Back number is every 10, so #/# is every 270 stamps. Appearance is very close to the newest PSA Seacoast other than the date has a slimmer and taller 2003. Carl Wicklund writes to say that he found a new plate number, V21111, on the (10�) Atlas Statue with round corners and a 2003 date. It was on a cover from Midvale, Utah dated April 18, 2004. 4/15/04 - Data pages for the (25�) American Eagle (10 designs) coil of 3000 and the (5�) Ashton Potter 3k PSA Sea Coast coil have been updated with distribution information from the Postal Bulletin. 4/14/04 - The USPS today released technical details on the water-activated (25�) American Eagle (10 designs) coil of 3000. First Day Cover service will be available but there is no First Day ceremony. 4/13/04 - Scott Publishing Company has assigned #3829A to the 37� Snowy Egret coil printed by Ashton Potter. 4/12/04 - The results of our PNC3 auction #30 which ended March 27, 2004 are now posted online. All the auction information can be accessed by using the 'Membership' button, or by clicking here. Thanks to Auctioneer Joe Sedivy for another successful auction. Alan Thomson announced in his 'Snippets' column in the April 2004 issue of Coil Line that it would be his last one. Alan plans to continue doing the Coil Line distribution. Thanks for a great job over the years. John Cropper reports on the early use and a scan of the yet 'officially' unreleased (5�) Water Activated Sea Coast coil of 3000 with a 2004 date. Details are on the club message board which can be accessed from the 'Membership' bar on the left. 4/9/04 - Donna Rajotte in Providence reports that she has the 2004 Ashton Potter (5�) Sea Coast PSA coil of 3K, with plate P2222 every 27 stamps, and blue top/bottom back numbers every 10, on odd coils. All positions are possible with 270 stamps. USPS item number 782700. Donna adds that these seem the same as the Ashton Potter coils of 10k except for the plate interval and the plate number. Bob Rabinowitz reports that the stamps bear a 2003 date and are die cut on all 4 sides. The date on the earlier version appears more intense although his source cannot conclude that it's any wider or taller. The die cuts are identical in all respects suggesting that the same equipment was used. Technical details from USPS are here. A PNC3 Regional Meeting is scheduled at the Plymouth, Michigan Show on April 24 from 10:30 am till Noon. The show is being held at the Plymouth Central Middle School, Church Street and Main. Check the bulletin board at the school for location of the meeting. 4/8/04 - The Summer 2004 USA Philatelic Catalog lists a 23� Wilma Rudolph coil of 100. Liz Carter at USPS Headquarters in Washington reports: "The stamps will be issued as a pane of 20 in offset intaglio, a convertible book of 10 in offset and a vending book of 10 in offset. We are not issuing it as a coil of 100." A phone clerk at SFS verified that the coil is currently listed on their computer with order number 782440. 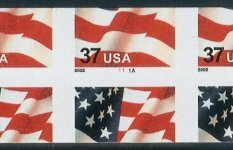 4/5/04 - Thanks to an article in the April 12, 2004 issue of Stamp Collector, we are able to confirm a few more details on the 2004 SSP printing of the 37� U.S. Flag. The data page has been updated. 4/4/04 - A data page has been added for the (5�) Ashton Potter 3k PSA Sea Coast coil to be issued April 6. 4/1/04 - The USPS has provided technical details on the new Ashton Potter 3k PSA Sea Coast coil to be issued April 6. 3/31/04 - The April 2001 issue of Coil Line is now online in the 'Reference' section. A link to the American Air Mail Society has been added to the Society and Clubs section. 3/26/04 - This report comes from Jay Bigalke. Those are the details as of right now...I don't know who's printing which stamps. 3/25/04 - Dr. Robert Rabinowitz reports a new 37� Snowy Egret coil printing with plate P11111 and a 2004 date. Bob adds - What appeared to be a leader strip is merely a wrapper. Unlike the Sennett Flag rolls of 100, the wrapper has no glue on it and there is no "sticky stuff" anywhere in the roll. Renate Fearonce in Tucson has the new printing. Renate writes "782200- PSA Egret coil of 100, P11111, every 31 stamps. The plate numbers do have a red digit, but there is no sign of red in the design. This coil has 2004 date. Die cut is very different from previous coil. It appears more of a wavy line, as the original Egret coil has deeper die cuts. Coloring is very close although the original Egret might be a shade more yellow. Packaging of this coil is also very different. It comes in a box of 50 with each coil individually shrink wrapped. Each coil has a paper wrapper around it that shows the picture, bar code and a description of the stamp." Howard Levine notes that the full USPS order number from the CAVE for the new 37-cent 2004 Egret coil of 100 is 782241. 3/18/04 - Both Craig Selig and Joann Lenz added to the Plate Number Coil Souvenir Page spreadsheet. I'm still in need of plate number reports on the 2003 issues. 3/16/04 - Donna Rajotte in Providence reports that she has the (10�) NYC Public Library Lion PSA coil of 10k, plate number S44444 every 21 stamps, pink top/bottom/middle back numbers every 10 stamps, 210 stamps for #/# hit. USPS item number-791800. Arthur Westneat sent a copy of an APS certificate issued to Ken Moreau for an Untagged PNC3, plate #3 of Scott 1895c, the 20� Flag over Supreme Court. Doug Iams notes that he reported the same thing in the September 2000 issue of Coil Line in the Snippets column. 3/10/04 - Renate Fearonce in Tucson has plate S1111on the new 2004 SSP printing of the 37� U.S. Flag. This has top pink back #s in position 4. She also has other recent commemoratives. 3/2/04 - A revised Plate Number Coil Souvenir Page spreadsheet in Excel format has been posted. Thanks to the American Society for Pages and Panels for their assist in this effort. There are still a few plate numbers and positions that we need to verify. 2/28/04 - The March 2001 issue of Coil Line is now online in the 'Reference' section. 2/27/04 - Donna Rajotte in Providence reports that she has plate V46 on the 23� Washington and plate 1111A on the BEP 37� US Flag coil of 100. 2/25/04 - A Plate Number Coil Souvenir Page spreadsheet in Excel format has been posted. There are still a lot of 'holes' and your help is needed to bring it up to date and make corrections. 2/23/04 - Auction Director Joe Sedivy has the lots for PNC3 Auction #30 posted. The auction ends March 27 and you must be a member to bid. Click for a 'Word' or 'Works' file and here for the bid form, or go to the 'Membership' tab for this or past auctions and/or to join the club. Joe asks that you please include your email on your bids. 2/22/04 - Carl Wicklund reports that he purchased plate #S2222 on the 2003 Sennett (SSP) 37� U. S. Flag coil in Mc Allen, Texas. Carl said that his coil did not come from a stick as was the case with S1s and S3s. Shortly after I heard from Carl, Chris Landa sent in the attached scan. A clerk at Stamp Fulfillment Services confirms that the new 2004 SSP printing of the 37� U.S. Flag is now available from Kansas City. They show an issue date of January 12, 2004, although the coil of 3000 is listed as being available on December 22, 2003, which is probably in error. A strip of 25 from the 3000 coil is item #780231 and a coil of 3000 is #780241. A strip of 25 from the coil of 10,000 is #780331, while the whole coil is #780341. No First Day Cover is available. 2/21/04 - Dr. Robert Rabinowitz has a confirmed report of plate S44444 on the (10�) Lion PSA coil. Bob also notes he has plate V45, both VP and PV on the 23� Washington in stock. 2/17/04 - Rob Washburn, who specializes in PNC covers, has been added to the PNC3 dealer page. Click on the 'Collecting PNCs' Tab to find him. 2/16/04 - Donna Rajotte in Providence reports that she has the new 2004 SSP printing of the 37� US Flag in coils of 10k, plate number S1111 every 20 stamps, pink 5 digit top/middle/bottom every 10 stamps with position 2 (one to the left of the plate number) back numbers every 20 stamps. She also has gotten some more of the SSP .37 Flag coils of 3k (780200) top/bottom/middle back numbers in position 4 (one to the right of the plate number). 2/11/04 - Chris Landa received a new number, V45, on the 23� Washington in a shipment from USPS today. Chris is a new member of PNC3. Thanks for passing on the information and welcome to the club. Renate Fearonce in Tucson has plate 1111A on the BEP 37� U. S. Flag PSA coil of 100. Plate number is every 24 stamps. 2/10/04 - Scott Publishing Company has assigned #3632C to the Sennett printing of the 37� U.S. Flag coil with the 2004 date. Renate Fearonce in Tucson has the Egret PSA coil of 100  V3222. She only has 2 coils with P/V. Not enough to go around, but she does have about 10 strips of 11 stamps, but only one to a customer. The 10 strips have been sold. Renate sent her latest inventory. 2/9/04 - A new feature that several people have asked for has been added. Down near the bottom of the page is a pink box that you can use to sign up to be notified when this page is updated. There is also a box on the booklet home page for the same purpose. Clicking on the 'USA booklets' tab will also tell you when that section was last updated. 2/7/04 - A new discovery has been reported by Brian Engler, Sr. on the 29� Sunrise Love coil, Scott #2813b. A plate number strip of 5 has been found with the liner printing upside down in relation to the stamps. Click on the link or the photo. (2/8/04) Doug Iams notes that the upside down liner on the Sunrise coil was first reported in Alan Thomson's July 2003 Snippets column in Coil Line. The coil, discovered by Mike Courtney was also pictured. 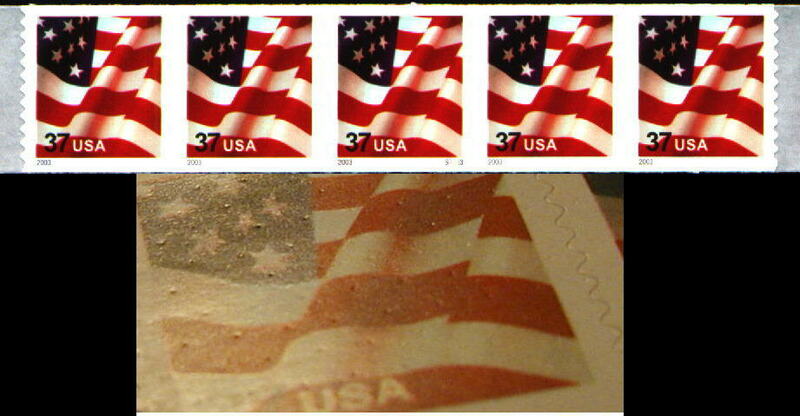 2/6/04 - The new 2004 3K SSP printing of the 37� US Flag stamp is in and scanned. The checklists and the 37� US Flag comparison page have been updated. Steve Esrati relays a report that Al Haake found a new version of an old stamp, the 5� Mountain with water-activated gum and the plate-number combination S111. On the original issue of the stamp, Haake said, the top of the mountain glows brightly under both long- and short-wave ultraviolet. But on the reprint, the top of the mountain is dark. Al said that it comes with all sorts of back numbers, including number on number. (2/8/04) Gene Trinks notes that the "new" find of Sennett Mountain S111 with UV-active yellow ink isn't new at all. 5 of the 7 mint copies with active ink that Gene has have been in his collection for years, and seven of the 20 used copies also have the same. Be advised to check your copies. 2/2/04 - Rob Washburn announces that his latest commercial covers pricelist will be available on 2/5/04. Anyone who wants one, can send him a SASE at Rob Washburn, P.O. Box 840, Skowhegan, ME 04976. Jeff Fiszbein reports that he found two strips of 4 of the 3� Star coil with very smooth green tagging (no plate numbers, though) in a mixture. They came off charity reply envelopes (with a strip of 5 of the 5� Toleware coil), but the charity is unknown since they are only the 'cut' corners. 1/30/04 - The February 2001 issue of Coil Line is now online in the 'Reference' section. 1/25/04 - Jeff Fiszbein found the 37� Snowy Egret with plate V3222 at his local PO yesterday (NW of Detroit). His roll has the 'bell' at the bottom. The new number has been added to all the affected pages. David Schwartz of DMSSTAMPS found a roll of the 37� Sennett US Flag, plate S3333, with tiny "dots" on the face similar to a 19th Century grill. These impressions, which look like potholes, are on every single stamp in the roll that he found with this anomoly. The dots are in a pattern all across the face of the stamp similar to the arangement of the stars on an actual United States flag. Click to see the scan that was on eBay. 1/21/04 - Jim Nelson writes to say that his new 2004 price list is ready. Click here and then scroll down for details. Doug Iams reports that the Santa Rosa, California philatelic window was closed earlier this month. 1/20/04 - Dr. Robert Rabinowitz has a report of plate V3222 on the 37� Snowy Egret coil stamp. This is an advisory notice and the number will not be listed until confirmed. 1/17/04 - Our newest member, Victor Bove #1794, is also a dealer and a link to his web site can be found using the 'Collecting PNCs' bar or by going to the dealer page. 1/15/04 - Renate Fearonce in Tucson writes to mention some new, older and odd items she has available. 1/12/04 - Lorelei Doering reports that Bridgeview, Illinois (Moraine Valley P.O.) closed the Philatelic Counter a month or so ago from lack of use. Marios Theodossiou writes that the link to EzStamp, in Online Resources, Software, has changed. The new link is www.ezstamp.com. Marios is offering any PNC3 member a 25% discount on their software. 1/9/04 - Anthony Willson called to report that there will be a Regional PNC3 Meeting tomorrow, January 10, at ORCO EXPO at the Embassy Suites, 11767 Harbor Blvd., in Anaheim/Garden Grove, California. Meeting will be from 11:30 am till 1:30 pm. Jack Wasserman is in charge. 1/6/04 - Mike Sagstetter inquired about the difference between Scott 3632a (BEP) and 3632A (Sennett), which led to my discovery that the 3632a was not identified as Imperf on the 37� US Flag Data page. That omission has been corrected. 1/5/04 - Richard Nazar reports that his Microsoft Excel spreadsheet of basic PNC Catalog Numbers was updated on December 30, 2003. Click here for the announcement. 1/4/04 - Fred Sener passes along word that there will be a Regional PNC3 meeting at the 51st Sarasota Florida National Exhibition on February 7, 2004. Click for more details. 1/2/04 - Donna Rajotte in Providence reports that she has an additional supply of the (5�) Seacoast, Ashton-Potter printing with perfs on all four sides, PSA 10k. Plate number P1111 every 22 stamps, top and bottom blue back numbers every 20 stamps. Odd and even coils- 220 stamps needed for positions 2 & 4 OR positions 1, 3, & 5. USPS item number 781400.